System-6 has all parts (2 clamps and an adjuster) connected to the wire.. The system is available in 5 lengths and all systems are single packed, including the inlay and screws. It covers wooden frames/mirrors from (glassdimension) 800 mm - 1800 mm / 51 1/2" - 70 3/4". The single bags can be added into ready-made heavy-frames/mirrors final packing. It saves you time and there is no need to add a static hanger on the frame. The single bags are also excellent items for shop-sale for use on heavy-frame/mirrors etc. For use on 20+ KG / 44+ lbs-frames we advise you to combine our system with static-plates. This system is adjustable for end-users. 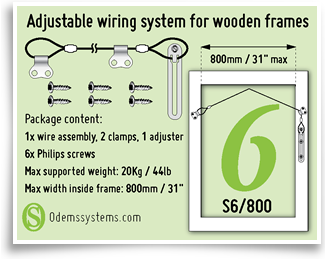 Systems/Wires can be used for frames in all different shapes. The normal square-frames, but also the oval, round or even rectangular frames!